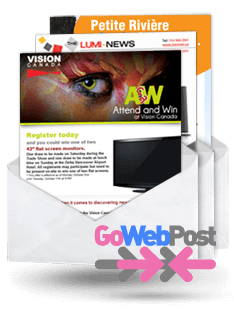 GoWebPost is an application designed by Art Systems Canada, which allows companies and individuals to send email messages to a large number of people at once. Manage your mass mailings 24 hours a day, 7 days a week, from anywhere in Canada. For the success of your email campaigns, Art Systems can guide you and help you build effective marketing strategies. We can help you design your messages, in terms of content and graphic design, to reach your target audiences effectively. A powerful message can create a surprising enthusiasm and make sales. Think about it! At all costs, we want to keep your company from being considered as "spam". That's why we pay attention to the ethics of your mailing lists. For better efficiency in your mass mailings, it is essential to keep your email lists up to date. Reading rates and statistics can be made available to you in a GoWebPost account. Moreover, for a better understanding or to change your marketing strategy, our experts are available to help you. Reach thousands of people with GoWebPost's mass emailing application! To have a look at the newsletters we created for some of our clients click here!